The Friends Bench has now been installed in the foyer at The Wilson. The bench was a gift from the Friends to The Wilson to celebrate our 30th anniversary in 2014. 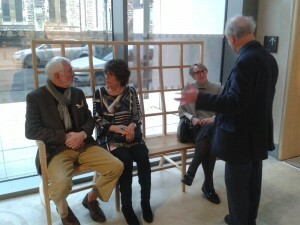 The bench was designed by Chris Eckersley and made by Dave Green of Sitting Firm. Its design draws inspiration from both The Wilson’s Arts & Crafts Movement collection and its Antarctic collections. The English ash that makes up the frame of the chair was carefully sourced from woodland in nearby Herefordshire, while the elm for the seat came from a sustainable plantation in Scotland. These are traditional chair-making materials, and echo the traditions that both Eckersley and Green draw on in their work. Chris Eckersley trained at Gloucestershire College of Art. During a career spanning forty years he has designed for manufacturers and retailers such as Heal’s, the Conran Shop, Lloyd Loom and Liberty, as well as undertaking bespoke commissions for individual clients here and in the United States. Chris received The Prince’s Medal from HRH The Prince of Wales at the V&A Classic Design Awards in 2002, and more recently a Design Guild Mark from The Worshipful Company of Furnituremakers. He is a Fellow of the Royal Society of Arts. For The Wilson Bench, Eckersley first produced a series of sketches and drawings before making a full size prototype which members of the Friends committee were able to view, try out and sit on. 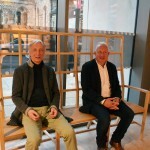 Wishing the bench to encompass the very best of traditional and contemporary chair-making, Eckersley invited Sitting Firm – the UK’s leading craft-based chair-makers – to assist in the making of the final piece. Sitting Firm was set up by master craftsman Dave Green, and has developed an international reputation for producing traditional chairs.